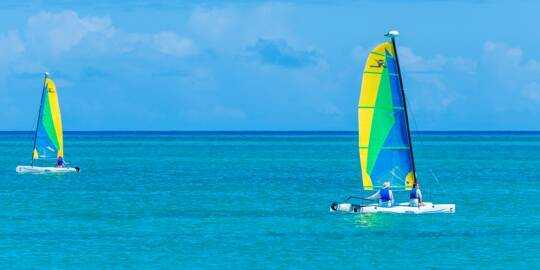 Hobie Cats on the beach at Club Med, Providenciales. Kayaking in the Princess Alexandra National Park. 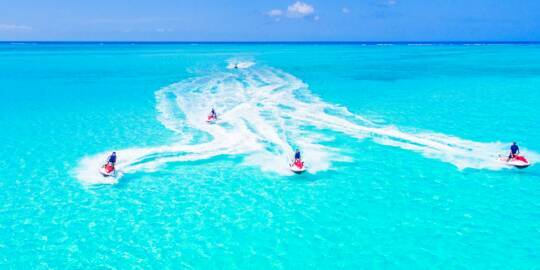 With crystal-clear ocean water and a pristine marine environment, Providenciales is an unparalleled destination for water sports. There’s a tremendous selection of things to do on and in the ocean. Many boat tours can be booked as private charters, allowing the excursion and activities to be tailored to exactly how you’d like to spend the day. For those looking to save on vacation costs, deals and specials can often be booked during the “ low season”, when tourism arrivals are at the lowest point of the year. 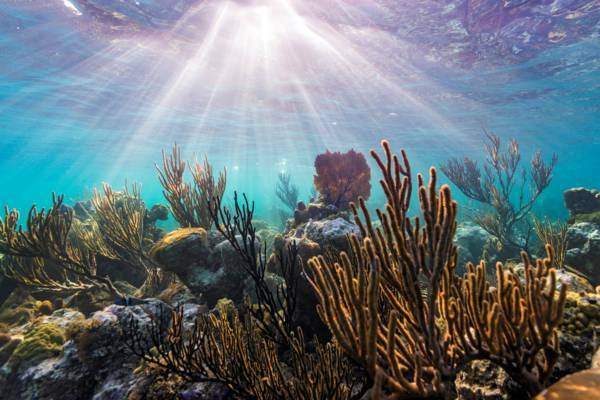 The Turks and Caicos is home to one of the largest barrier reefs in the Caribbean, and this system surrounds almost the entirety of the Caicos Islands group. 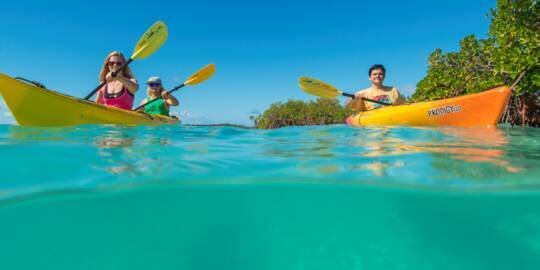 Providenciales offers the best beach snorkelling of any island in the Turks and Caicos. At the central Bight Reef and Smith's Reef, there are beautiful reef systems starting close off the shore. 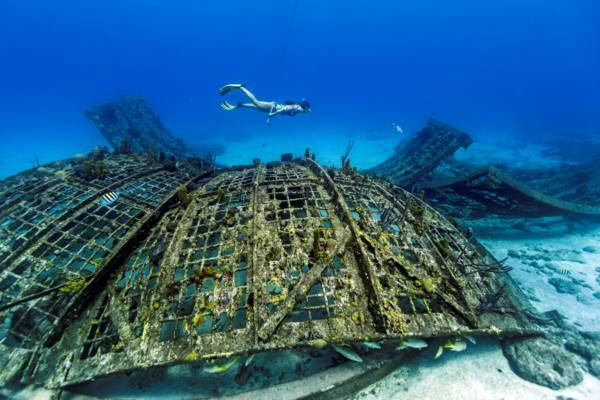 The beautiful reefs in the Turks and Caicos. When snorkelling the beach reefs, you’ll likely won’t see large sharks, dolphins, or whales, however, the variety and number of colourful reef fish is excellent. It’s common to spot queen angelfish, French angelfish, yellowtail, stoplight parrotfish, trumpetfish, jacks, snappers, French grunts, butterflyfish, damselfish and more. The coral is impressive as well, and there are sea fans, sponges, sea urchins and anemones too. In the sea grass surrounding the reefs, turtles, southern brown stingrays and spotted eagle rays can be seen gliding by. 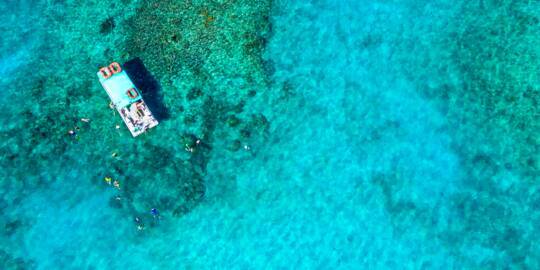 Snorkelling is an activity that can be enjoyed and appreciated by the whole family. Safety is of course key, and it’s advisable that a flotation or snorkelling vest be worn by anyone who’s unsure in the water. 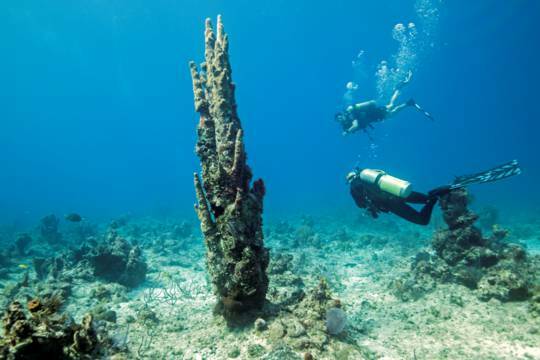 The Turks and Caicos is renowned for its pristine reefs and coral, and Providenciales is a great destination to dive from as sites along the entire western side of the Caicos barrier reef and wall are regularly accessed from the island. Each region of reef offers a unique aspect. 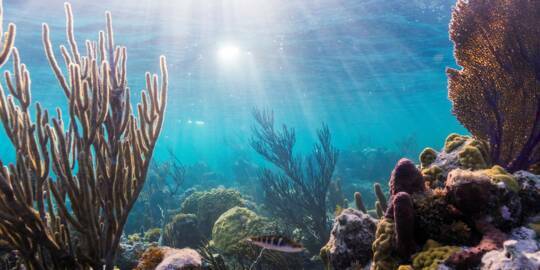 The walls of Northwest Point and West Caicos are impressively sheer, Grace Bay offers fascinating spur and grove formations, and the wall off French Cay, lit by the sun due to its southern exposure, is home to some of the most impressive coral in the country. Freediving at the Thunderdome at Malcolm Roads. Grey reef sharks are common at many barrier reef sites, and dolphins, manta rays, hawksbill turtles and leatherback turtles can be spotted as well. Freediving is a sport that’s gaining wider recognition. Blurring the line between an extreme sport and an eco-activity, this sport utilizes a mask and fins similar to the common snorkelling set up. The edge of the Caicos barrier reef makes for a spectacular playground, and with a little practice, it’s easy to dive down to depths of 30-40 feet (9-12m). Experiencing the reefs and wall with the simplicity of freediving is amazing. 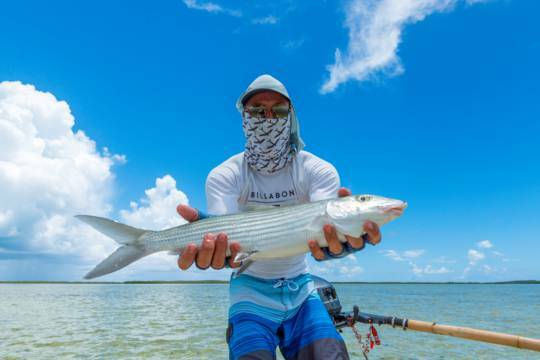 Due to the associated dangers and risks, it’s recommended to receive professional instruction, and to have a rescue boat present when freediving. Extensive and ecologically-important mangrove wetlands cover a large percentage of the Turks and Caicos. These unique habitats are teeming with wildlife and natural beauty. 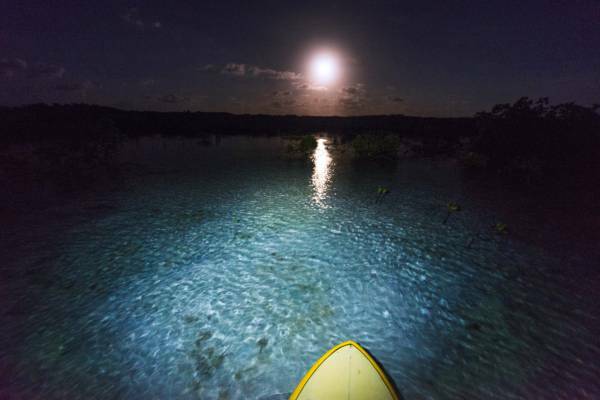 Full moon stand up paddle boarding in the Turks and Caicos. Far too shallow for most motorized vessels, these channels and wetlands are best discovered by the silent kayak or stand up paddleboard. As the nursery for countless species, wildlife sightings above and below the water’s surface area common. Every location is different, yet you’ll likely get a close-up view of juvenile lemon sharks, stingrays, turtles, starfish and conch. Hiding in the dense mangrove are green herons, and in the sky above, pelicans, egrets and frigatebirds. 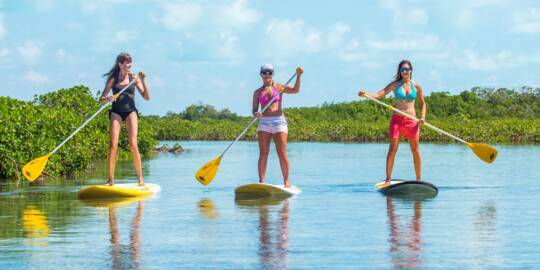 Depending on your preferences, it’s possible to either rent kayaks and paddle boards, or take a guided eco-tour. Both routes have their respective advantages, yet there’s so much interesting life to be discovered in the wetlands and a guide with be able to identify and find the creatures that are often overlooked. Water sports, powered simply by the elements, are making a big comeback. You’d be hard pressed to find a better spot for learning to kiteboard at than Long Bay Beach on Providenciales. Here, the brilliantly-turquoise water is only waist deep, and the bottom is soft white sand. There are quite a few kite schools to choose from, and many students will be able to kite on their own after 8-12 lessons. 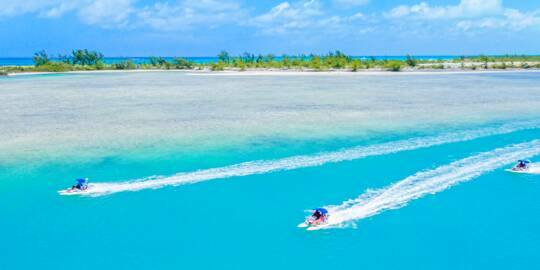 Surfing in the Turks and Caicos. There are countless locations throughout the islands for an experienced kiter to explore. 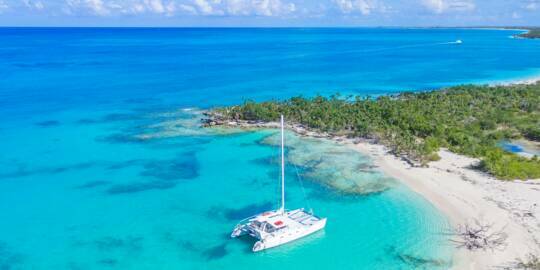 A day trip to North and Middle Caicos or South Caicos, or a downwinder through the Caicos Cays will offer kite sites and vistas that very few have the opportunity to experience. Flat water windsurfing is likewise great, and equipment rentals and instruction is available from some of the kite schools. 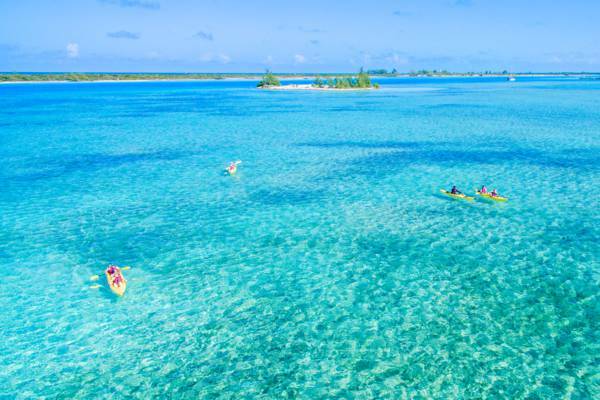 We don’t have the predictable breaks that some of the other Caribbean surf destinations have, yet when the conditions are right, both conventional surfing and stand up paddle surfing on the barrier reef is exquisite. Some water sports companies are not licenced. You will typically have no legal recourse in the event of an accident. This is especially common with banana boat and other wake ride operators. You may want to confirm an operator is licenced before using their services. Some water sports companies do not carry insurance or have inadequate insurance. This is especially common with banana boat and other wake ride operators. In the event of an accident, you will be responsible for your complete medical costs. If you have health insurance, you should be aware that you may not be covered for sports accidents and accidents outside of your home country. In additional, travel insurance does not usually cover sports accidents. You may want to confirm an operator is properly insured before using their services.